The thing that I love about indie games is you'll always find those special little gems that think out side the box and throw sanity out the window. Today I'll be taking a look at Flippin' Deadanother free web browser game by Juicy Beast Studios. Well this is a tricky one. To put it simply there isn't really a story, you'll start the game by being spawned into what looks to be a grave yard. Oh and you're an orange bear...with sun glasses. Yeah, okay, if you're not already playing this game then you've got to be nuts. Well, if that doesn't make you want to play the game then this should: Zombies. You're an orange bear (wearing sun glasses) in a graveyard being attacked by a bunch of zombies. There may not be a plot but come on, there are zombies and an orange bear. That's all I need. If you thought this game couldn't get any better, well then you're gonna need to buckle your seat belts because it DOES! After you've gotten over the fact that you're playing as an orange bear, you'll notice that there are crates popping straight out of the ground. Your objective is to avoid zombies and collect as many crates as you can by hitting them open with your head. These crates do pretty much anything. Some will add points to your score multiplier, some will even have power ups that will help you in some way. Although there's one crate that you'll want to be looking out for: I like to call this crate 'Happiness' because that's what you'll be feeling every time you see it. The happiness crate makes everything change places. The grave yard turns into a lovey rainbow filled world, the zombies turn into humans and most importantly you turn into a zombie...YEAH! At this point you'll begin to over dose on epicness. Honestly I've recommend this to everyone I know (which happens to be a dead Mexican and a drunk car dealer but that's not the point). You should play this game and you'll enjoy it. Play it for Free HERE! I know for a lot of us, when someone starts talking about free web based games (Flash games that are played from your web browser like Farmville, Cityville,etc), the gamer inside of us cry's just a little. So I know when I say that Knightmare Tower is a free flash based browser game a lot of you will close this window and go find another review to go watch or read. All of you who are still reading this, I thank you for keeping your minds open. 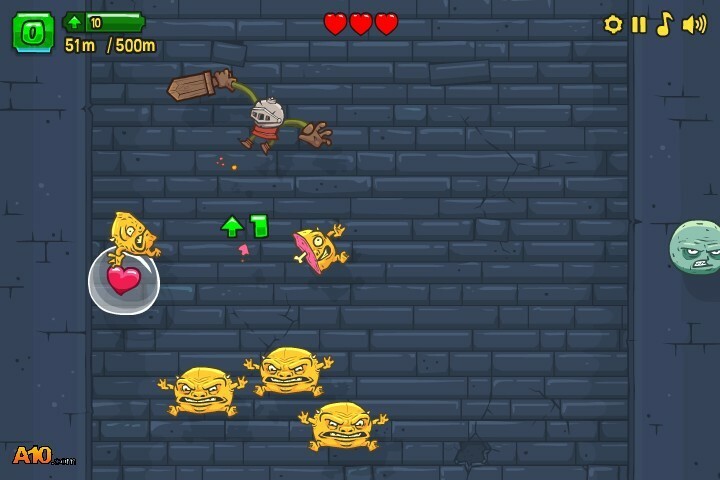 Intro - Knightmare Tower is a charming little game by the guys at Juicy Beast Studios. When you first start up Knightmare Tower, you are presented with a very well animated intro that explains the plot of the game--which is to save your king's 10 daughters from a very tall tower that is full of unfriendly monsters that wish to make you their dinner. Gameplay - Right here is where you'll start to see why I recommend this to everyone I come across. Hands down this is one of the best high score arcade game I've played in a long time. (I'm not going to really explain the gameplay as much as I should but I've made a video review for this game which you would have seen at the top of the article--in the video I talk about pretty much everything in the game so after you've finished reading this you might just want to watch the video if you want to know more about the game.) The game is all about launching yourself into the highest point of the tower. To do this you kill monsters to keep on going higher. It's really hard for me to explain but you should be able to understand what I mean by having a look at the screenshot down below. There is no rating system at all. Just me and my ramblings about playing video games that I've played recently.